StressLess camping is what it’s all about but we’ve also described some StressLess Camping that wasn’t so stressless. There are other campers who are working to make sure people and their places remain stressless and those are the people in the emergency services who work to squash these fires. This is the story of camping at the fire camp during the Mendocino Complex fire. A shot of the fire camp with the Mendocino Complex fire in the background. In the mid-ground are the sea of RVs from participants who are using them to call home during this work. Among the thousands of people who show-up in these pop-up cities are RVers who live full- or part-time in their RVs and follow these “cities” around to participate in the work of keeping our lands safe. We’ve come into contact with a number of those at the dealership where I work as they shop for new homes to bring with them into these fire camps, as they’re called, and provide a little taste of home while they’re away working. 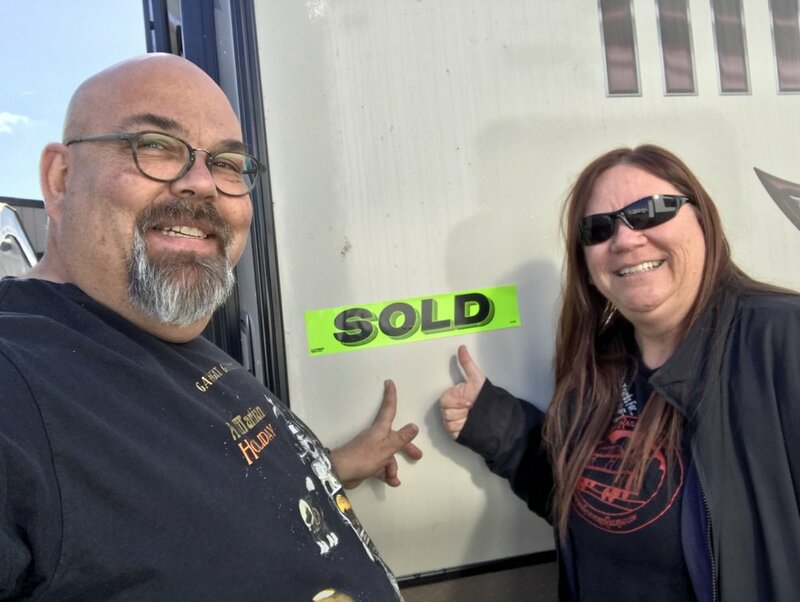 “I just want a place to come in and grab a beer and put my feet up,” said one of our customers just before he pulled his shiny new travel trailer off our lot. While the work used to be more infrequent the pattern of wildfires here in Northern California means it makes sense for these protectors and all their support people to be able to spend time away from home, or even make a new home on wheels, as they follow the fires all over the west coast. When you think about it our customer is away from his family for weeks or even months while teams battle the ever-increasing number of blazes that seem to like visiting California. And there are people of all capacities in these fire camps - the individual happened to be a diesel mechanic. Without him, there would be no fire trucks and bulldozers running around. We’ve been asked not to mention his name and he wasn’t the only one who left with a new trailer destined for the fire camp that is just up the road from us. He called to our attention just what the vehicles are subjected to, heading into dusty, hot conditions that are far less than ideal for any engine and toughing it out for hours as the humans around the vehicle face the blazes head on and do their very best to keep people’s hopes and dreams and homes from becoming just a memory. Another shot of the fire camp as I exited the highway. In fact, after the roads were reopened it was clear that firefighters had stationed themselves at people’s residences and kept the flames at bay. The charred remains of trees and brush came within a very short distance of the homes on the side of the road. These residences were oases of green and color in an ocean of blackened wilderness. It’s incredible the jobs they do! Like all components of these fire camps, the kitchen operation for these incidents is incredible, serving three meals per day to the thousands of people working on the fire. CalFire shoots for 4,500-4,800 calories per day which they estimate as being able to sustain the energy expenditure of a day’s work on the line battling wildfires. So what’s on the menu? Roasted chicken, steak, pulled pork sandwiches and western bacon burgers are some recent dinner options. Breakfast is the full spread - eggs, bacon, potatoes, bread, and fruit. A substantial bag lunch gets firefighters through the hours between breakfast and dinner. The food is prepared by California prison inmates, who take pride in putting on food fit for royalty. Some accommodation, such as gluten free, vegetarian and vegan options are available. About 3,000 people, including firefighters, administrators and workers live at the camp in downtown Ukiah. The site was chosen because it was big enough and close enough - although not too close - to the front lines of the fires. Another of our customers is himself a customer, of sorts, of the first man mentioned here. This second individual operates the big bulldozers. The job these guys do is unreal - basically they drive right into the fire and cut “fire breaks.” These are paths cut by the gigantic bulldozers in an attempt to create a wide swath in the landscape that has no vegetation with the idea of stopping the fire. It’s basically a road through the wilderness. 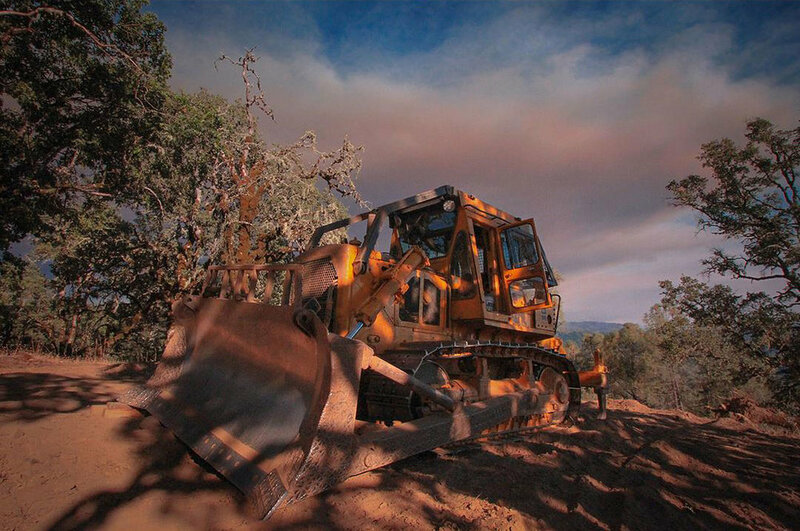 Often times multiple bulldozers operate in a side-by-side fashion cutting a wide path in the forest which can effectively stop the fire at that path. Sometimes these guys will drive right into the fire at night to cut these paths which is incredibly dangerous work. When my customer’s wife came in to sign all the paperwork she showed me a video on Facebook that he had shot with his phone. There he was with the fire right in front of him basically driving this huge bulldozer right into the fire. While our human instinct is to run from things like this he and others like him get paid to drive right into it. Scary. Our camp for the first half of the evacuations. The whole team of people it takes to work a fire is unreal. Cooks, medical people, sleeping trailers, mechanics, logistics, media, supplies and everything needed to create a none-too-small mobile city that sets up almost overnight and serves the people protecting the community. Then there are the fire fighters themselves who came from as far away as New Zealand to battle this blaze. Oh, and don’t forget law enforcement who draw the thin blue line between common sense and head-scratching behavior. For most of us our RVs are a source of relaxation and enjoyment. They represent adventure, beautiful places and time with some of our favorite people. But there are also a lot of people who have RVs as second homes while they’re busy doing some incredible work in keeping our homes and lands safe. That way we can continue to enjoy StressLess Camping.